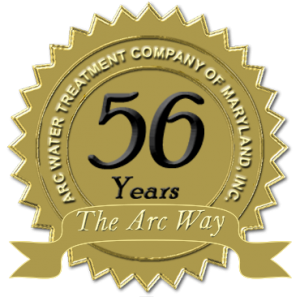 The Arc Way – Arc Water Treatment Company of Maryland, Inc. Since 1963, Arc Water Treatment Company has earned a reputation for reliability and proven performance serving the commercial water treatment needs of our customers. Based in Jessup, Maryland, Arc is conveniently located to serve the entire Chesapeake Bay Region, including Maryland, The District of Columbia, Northern Virginia, Delaware, Pennsylvania, New Jersey, and eastern West Virginia. The range of Arc’s water treatment capabilities include Complete Water Treatment Services, Specialized Treatment Chemicals for all HVAC systems, State-of-the-Art Chemical Feeding Equipment, expert technical support and a tradition of skill, efficiency and dependability. Arc is proud to be The Region’s Premier Water Treatment Company. Edwin F. Goldstein, P. E., Chairman, a chemical engineer, founded Arc in Philadelphia in 1963 and has made service quality Arc’s first priority. In every facet of the company, Arc’s goal is to offer our customers top quality and excellent value for their dollar. David L. Goldstein, President, a graduate of the University of Maryland, has been an integral part of Arc’s continuing success since 1980. With David as our President, we look forward to many more years of success. We strive to exceed customer expectations every day. We build trust and confidence through outstanding service, assuring our customers that Arc gets it done. Above and beyond is the norm. We keep our promises. We do what we say, and we will do it when we say we will do it. No exceptions. We sweat the details. We make every customer experience as easy, hassle-free, and satisfying as possible. We attend to every need or request with speed, care, and diligence. We are proactive in every customer interaction. We anticipate issues and proactively address them through superior service and timely communication across every customer interaction and relationship.